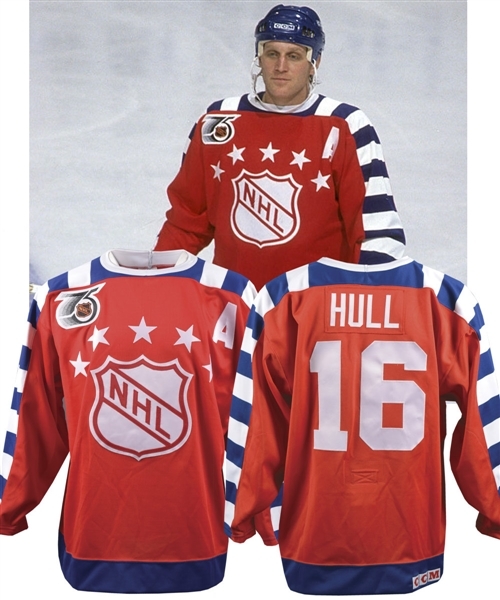 Making appearances at 8 NHL All-Star contests, Brett Hull would also see selection as a First Team All-Star for three consecutive seasons, from 1989-92. 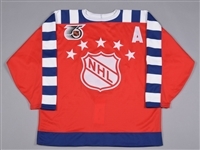 Hailing from his third consecutive selection in 1991-92, we have a Campbell Conference All-Star Game alternate captain’s jersey worn by the superstar. A 1947 “throwback” style jersey, a Maska Ultrafil label with affixed production date sticker (12/91) graces the collar along with a size “52” fly tag, with embroidered NHL and CCM crests over the back bottom hem. Styled with a beautiful tackle twill NHL shield crest in red and white, 5 tackle twill stars have been affixed arching over the upper chest, with “16” on verso in matching material along with the NHL 75th anniversary crest over the right breast. The fight strap is intact, with some minor red discolouration. A signed LOA from Brett Hull will accompany. With no unsightly marks or discernible wear, the jersey remains in gorgeous condition.